Big ticket energy-saving improvements include: Pella fiberglas windows throughout, Hardiplank fiber cement siding, low maintenance exterior trim, reflective insulation in crawl space and attic, plus solar fan. Roof was replaced in 2012 with HD architectural shingles. 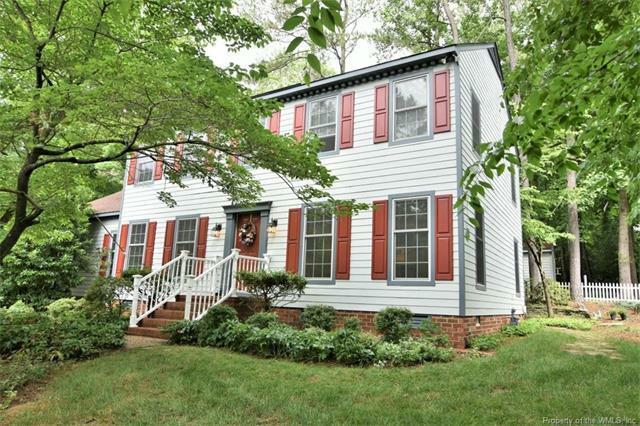 This classic colonial features 4 newly-carpeted bedrooms (unfinished hardwood under carpet), 2 1/2 baths, spacious family room over garage with gas fireplace and build-in bookcases, renovated eat-in kitchen, 2-car garage, and stone patio. Property is partly wooded with lots of dogwood and other trees, which shade the yard in summer and attract the birds. The newly-installed irrigation system helps to support the shrubbery and lawn. Conveniently located close by the Mounts Bay Recreation Center and just a mile from shopping center with grocery store and many other shops. See supplement for detailed information on features and upgrades.